Tunnels. Blackouts. Fantasies. Untold desires. Set on the confines of a train compartment, a businessman arranges for his wife and mistress to join him under false pretenses. As the play unfolds we discover his agenda, and what lies at the end of the journey. Derailed was first workshopped at the Fringe of Toronto Festival in May 1994. 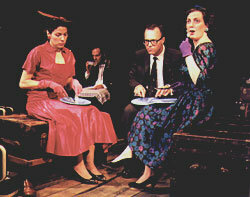 Stiletto Theatre Company – Catherine Hayos and Rena Polley – presented a professional production of Derailed when it premiered at the Factory Studio Theatre in March 1995. It was nominated for four Dora Awards, including Outstanding Production and a Best Direction nomination for Jim Warren. The play was selected for the inaugural CBC Performance Arts Showcase in 1998. An excerpt from Derailed was published in Two for the Show (Playwrights Canada Press, 1999). In 2002 the play was published in Seven Short Plays from Theatre Ontario, an anthology honouring Theatre Ontario’s 30th anniversary.